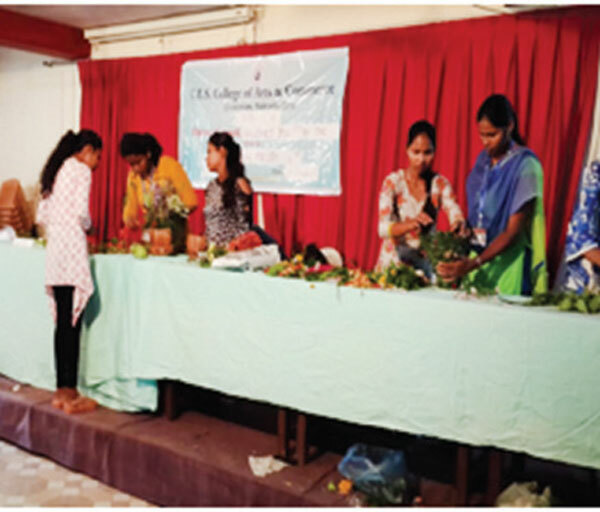 ‘Monsoon Fiesta’: a festival of competitions was organized by the Students Council of C.E.S College of Arts and Commerce. The event included a Rangoli Competition on the theme ‘Save Environment: Save Earth’. Students prepared rangolis, using organic material such as petals, sticks, saw dust, charcoal powder, raggi etc. The use of chemical material was strictly prohibited. The theme, ‘Save the Girl Child ‘was expressed vividly through posters. An eco-friendly Flower Arrangement Competition on the theme ‘Let’s appreciate the beauty of nature’ also formed a part of the event. Participants used wild flowers and earthen ware/coconut shells/wood etc to arrange flowers. The other competitions included a Mehendi Competition and a Sweet Dish Competition and a Ghumat -Aarti competition. The following students won prizes: Rangoli Competition: Dinorah Tavaris and group (TYBCOM), Priyanka Gaonkar and group (TYBA) Kingsley D’Souza and group (TYBCOM), won the first, second and third place respectively. Sanjay Gaonkar and group (TYBA) and Nisha Chowdary and group (SYBA) were given consolation prizes. In the Poster Making Competition , Priti Asundi (TYBCOM), Pranali Chari( TYBCom ) and Laxmikant Bandekar(TYBA) ,won the first, second and third place respectively . Arti Velip (SYBA) and Nikita Mangulekar (TYBCOM) were given consolation prizes. In the Sweet Dish Making Competition: Rekha Bind (SYBA),.Sudesh Gaonkar (FYBA), Priya Jaiswal (TYBA), Vinanti Borkar (SYBA) won the first, second third, and consolation prize respectively. In the Mehendi Competition, Sarita Naik (T.Y.BCom), Mehrunnisa Shaffi (F.Y.BA), Dipti Velip (F.Y.B.Com) and Apiya Dhuri (FYBCom. ), won the first, second, third and consolation prize respectively. The response of the students was overwhelming. The event was coordinated by Assoc. Prof. Maria Fatima Monteiro e Martins, Chairperson, Students Council, Prathamesh Niak Bhaireli, General Secretary, Prajay Dessai, Cultural Secretary and members of the council.